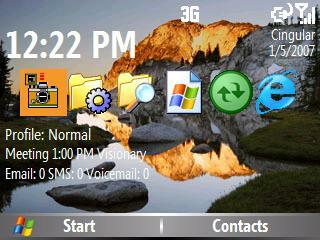 Motorola Q / Blackjack Lake Vista Theme 1.0 freeware for smartphone, Windows mobile phone free downloads. I recently purchased a Samsung Blackjack and have been playing around with the theme engine built into Windows Mobile 5.0 Smartphone. The theme below requires no special plugins and should work on the Motorola Q and Samsung Blackjack. It was derived off of the Just Black theme found at KOOLdezine and can easily be modified to add additional plugins and change the layout. Explorer your device using ActiveSync and copy the contents of the zip file to Application DataHome, then set the theme in the display settings. I realy like this theme but how do i downlod it to my phone?? After i Installed the theme, appears a white gross line in the bottom of the background picture. Could you tell me why? my first download, and i like it. i want a software for my samsung black berry,it just offed by it self so they said i will need to flash it. Thanks for spending time on the copumter (writing) so others don't have to.